After busting down the door at the big box stores and stimulating the economy, guests are invited to save even more at Terre a Terre as Chef Todd Villani welcomes guests with $25 off the bill on Black Friday. With every great deal comes the fine print, in this case to qualify for the $25 discount guests must leave their phones in the middle of the table and not touch them for the entire meal. That means no texts, no facebook, and no instagram. 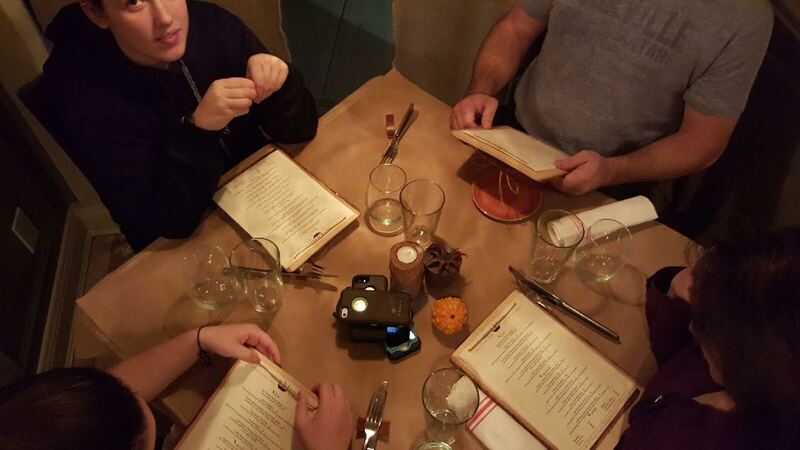 Imagine that – a group of people actually conversing, with each other, at dinner. Brilliant! Located in Carlstadt, Terre a Terre is a surprise from the moment you first pull off the freeway and drive the narrow streets of the borough that were obviously laid out in the era before automobiles. Carlstadt was actually organized by German immigrants in the 1860s and little details and motifs of that heritage can be seen here and there around town. Renovations and restorations have changed parts of Hackensack Street but those old values of hard work, passion for a job well done, and using the best resources around are everywhere, especially at Terre a Terre. Chef Todd Villani’s vision combines the best elements of local and seasonal market bounties and presents them in an environment the echoes a fresh approach to reduce, reuse, recycle. Terre a Terre has is one of the Garden State’s most acclaimed restaurants with glowing reviews from the New York Times, The Record of Bergen County, and numerous other culinary media outlets. Chef Todd Vilanni’s restaurant received 3.5 stars in New Jersey Monthly in 2014 – the first restaurant in several years to achieve such a high rating. Lunch – Wednesday – Friday from noon – 2:30 p.m.
Dinner Wednesday – Saturday from 5:30 – 10:00 p.m.
Brunch is served on Sunday from 11:00 – 2:30 p.m. Note: New Jersey Restaurants are permitted to sell NJ wines. It is the Garden State after all and promoting agriculture will prevent more of the state from turning into condo farms. Terre a Terre offers Unionville Wines. Follow Black Tie and Flip Flops on Twitter at @BlackTieFF, Like Us On Facebook, or email us at BlackTieAndFlipFlops at Gmail.